This season “Twelfth Night” with ten productions becomes the most produced play at the Stratford Festival. It seems, though, that directors at Stratford have run out of things to say about the play. For anyone who has come to think that Stratford no longer knows how to do Shakespeare, this “Twelfth Night” only provides more fuel for the fire. Nonsensical design, poor direction and weak acting have undermined the other three Shakespeares on offer this year. “Twelfth Night” provides more of the same. As everyone knows at the beginning of “Twelfth Night” the shipwrecked Viola finds stranded in Illyria. Historically, Illyria was an ancient Balkan country roughly where Albania is now that eventually became part of the Roman Empire. To Shakespeare, it simply means somewhere far away. Director Leon Rubin has decided that Illyria is India during the Raj. There is nothing inherently wrong with this except that Rubin makes absolutely no use of this setting to interpret the play. 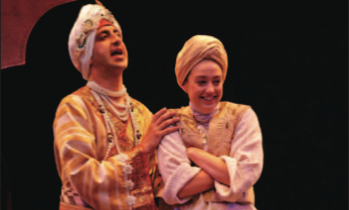 Orsino is Indian and Olivia is British. Throughout the play she seems to go native, progressing from Victorian dress to saris. This might make sense if she were in love with Orsino, but she is not. She loves Cesario, who is a foreigner. The trouble is that “Illyria” is a value-neutral place elsewhere, whereas the 19th-century India is not. Rubin shows us no tensions between the Indians and their foreign rulers or any political aspects of what the Raj means. By stooping to have Feste become a snake-charmer he shows that this setting does not “re-imagine Shakespeare in a more global and cultural context” as he claims in his Director’s Note, but merely trades on Western clichés about foreign country. The lively dance that concludes the play has more to do with modern Bollywood than the 19th century. The acting is depressingly uneven and breaks down into a competition between Stratford’s veteran actors and its newcomers. Brian Bedford is, of course, a wonderful Malvolio. He is one of the masters on this continent of speaking Shakespeare, knowing how to make his language seem perfectly clear and how to heighten his humour through emphasis and significant pauses. As is his wont he plays he big scenes directly to the audience and anyone who saw his Malvolio at Stratford in 1980 will have seen essentially the same performance he gives now. Yet, it is doubtful anyone has penetrated given so rich a performance in the role or makes us feel so clearly that Malvolio has been wronged at the end. As Olivia, Seana McKenna gives a highly nuanced performance as the bereaved being drawn against her will into love and Diane D’Aquila gives us one of the liveliest and most intelligent Marias of recent years. Both actors are also expert at speaking Shakespeare and finding the humour inherent in both character and text. Sadly, these abilities are true of no one else in the production. The worst offender is Andrew Massingham as Feste. Though made up as an Indian clown, Massingham speaks in a mumbling Canadian accent so that much of what he says is totally unclear and the humour lost. As the main singer in the play, Massingham is completely miscast. His voice is weak and he can’t carry a tune thus turning otherwise lovely songs like “When That I Was” into painful experiences. Whatever unknown dialect he puts on a Sir Topas renders him unintelligible. Sanjay Talwar, who has given so many fine performances elsewhere, proves a disappointment as Orsino. Compared to the other principals, he doesn’t project sufficiently in the Festival Theatre and simply can’t be heard properly. This naturally prevents his making a strong impression, but even his gestural language seems uncharacteristically stagy. Dana Green has recently given some fine performances but here is her Viola is all one note of pluckiness. She is good at playing the boy Cesario, but never with either Orsino or Olivia does she suggest that she is a servant. She delivers her famous Act 2 soliloquy as if it were all a joke rather than a serious problem to have the woman she is wooing for her master fall in love with her. Thom Marriott ought to make a good Sir Toby Belch, but his level of drunkenness varies so much from moment to moment you give up trying to find any coherence in his character. Don Carrier would make a good Sir Andrew Aguecheek except that Rubin has turned him into a Scotsman and saddled him with an impenetrable Scots accent. What is surprising is that Rubin seems not to recognize that with Massingham’s mumbling, Marriott’s drunken rambling and Carrier’s accent the comic effect of Shakespeare language is seriously compromised. Among minor characters Roy Lewis (Antonio), Shaun McComb (Sebastian), Jon de Leon (Curio), Sean Baek (Valentine) all display imprecise diction and inaccurate pointing of the text. It’s lucky that Robert King is cast as Fabian to give us at least one source of clearly understandable commentary during Malvolio’s famous letter scene. Despite the fact that the Raj setting is used to no purpose, it must be admitted that John Pennoyer’s set and costumes, especially those imitating Indian dress, are highly attractive. Robert Thomson uses light to help differentiate the realms of Orsino, Sir Toby and Olivia, but his most dramatic effect is in creating the “dark room” where the supposedly mad Malvolio is held. Michael Vieira tries to give the music to Shakespeare’s famous songs an Indian flavour, but the result is songs that are even more difficult for a non-singer like Massingham to sing. The clash of acting styles, the variety of accents and large number of poorly delivered speeches are hallmarks of a play that is under-rehearsed, carelessly directed or both. If the Stratford Festival wants to regain its fame as a forum for fine productions of Shakespeare, it cannot continue to place such ill-conceived, indifferently performed productions like this “Twelfth Night” or this season’s “Coriolanus”, “Much Ado About Nothing” or “Henry IV, Part 1” before the public or its reputation will slip even further. Photo: Sanjay Talwar and Dana Green.